Banner Maker Pro - Create any banner ad, web header, button, logo, mobile banner, image ad, animated gif or web graphic quickly and easily. Design a banner in any size and add any image. Free Trial. Web Headers are simply large sized banner ads at the top of a webpage. The banner at the top of this page is a web header. Surprisingly, there is no standard size (width and height) for web headers. Generally speaking, a width of around 700 to 1000 pixels and a height of 90 to 200 pixels will work. WordPress lists nearly 50 different sizes of header images for customized themes. Link. Header images can be in jpeg, png, or gif formats. Animated gifs are also supported. Size in kb is less important than it is with banner ads. However, a smaller file will load faster, and files that load fast are seen faster. If your file takes a long time to load because it is over a megabyte, visitors may not see the header and scroll down or click on a different site. Keep the kb size small. The fewer the kb, the faster the web header will load. Animation will work, but remember the rule to keep it small. The more animation you add, the larger the image and the slower the file will load. Any sized web headers can be made. Many options for animations, including over 60 One Step Animations. Backgrounds can be any color, gradient, or add your own image. Three different types of animations can be added, including over 60 one-step animations. Banner Maker Pro can make web headers fast and in any customizable size you need. 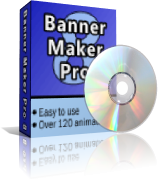 When you buy Banner Maker Pro, you also get the ability to make regular banner ads in addition to web headers. Banner Maker Pro is just $39.99 USD and can be purchased here.